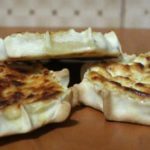 There are many different typical Sicilian recipes, starting from the most known ” Cuddura con l’uovo ” and following with the lamb which is not only used as meat during the Sundays Easter lunch, but this symbol has inspired also desserts and cakes. 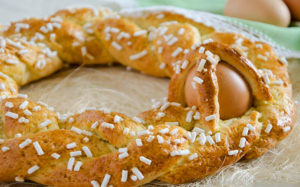 The term “Cuddura” comes from the old greek κολλύρα (kollura) crown, which was originally used to describe the shape that this Easter recipe has. Now days the term “Cuddura” has become a true Italian word very used in Sicily and also in south Italy. The are many different variants of this typical Sicilian Easter Recipe but they all have the same ingredients. The original form of the Cuddura was a donut shape and Shepherds used it to carry it in a more comfortable way, on their walking stick or simply on their arm. The most common “Cuddura” is circular; however, plenty of shapes can be found according to the local tradition. Another typical Easter Sicilian Recipes is a variation of the well known “Cassata” enriched with delicious Sicilian Almonds. The dough is prepared by working together the flour, lard, egg yolks, sugar and a little water so that it becomes smooth and soft. The almonds are peeled, roaster and chopped very finally along with the lemon skin. Everything should be cooked and mixed until you get a well-blended cream. A spoonful of filling should be placed within each rod to the pasta which will be made to assume the shape of a half moon. The cakes are then baked and served during the traditional Easter lunch. 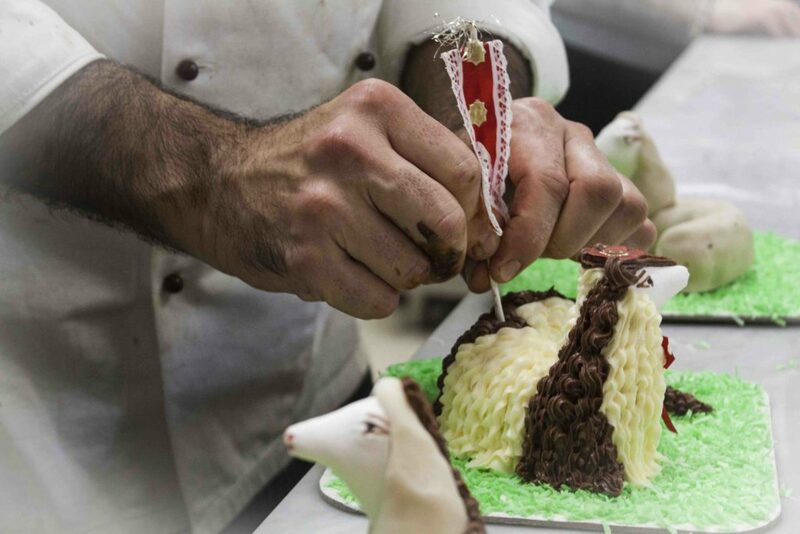 One of the Symbols of Easter is with no doubt The lamb, used as the main course of some Sicilian Easter recipes. This symbol has also inspired some sweet recipes, a first of these is the lamb of marzipan. The paste is the same they use to make for All Saint’s Day the famous “Ossa di Mortu”, the Bones of the Dead. To make it, you should mix equal weights of sugar and unbleached all purpose flour. Then you add a half-ounce of ground cloves every 2 1/4 pounds of the previous mixture. The ingredients have to be heated with some water in a pot. 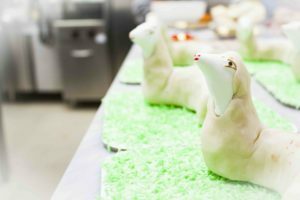 As soon as they are all melted into a paste, you can fill the lambs’ molds, pressing it down firmly with your hands.